Simple and Charming Projects to Make With Spool Knitting! Spool knitting is a craft that has been around for more than a century because it is fun and simple to do! Once you start, you will become hooked on spool knitting. Even better, you can use your knitting to make adorable little animals following the instructions in the step-by-step guidebook. 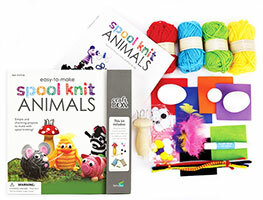 Also included in the kit is your own spool-knitting tool, loads of craft yarn to get you started knitting and plenty of craft supplies to make these charming toys!